...we brought Kipling home to live with us. We met him at the local ASPCA. He had been abandoned and was shaking scared. And yet, he immediately seemed to set his hopes on us. We saw at that first meeting that he could get along with Ben and that maybe he would be a good fit in our family. 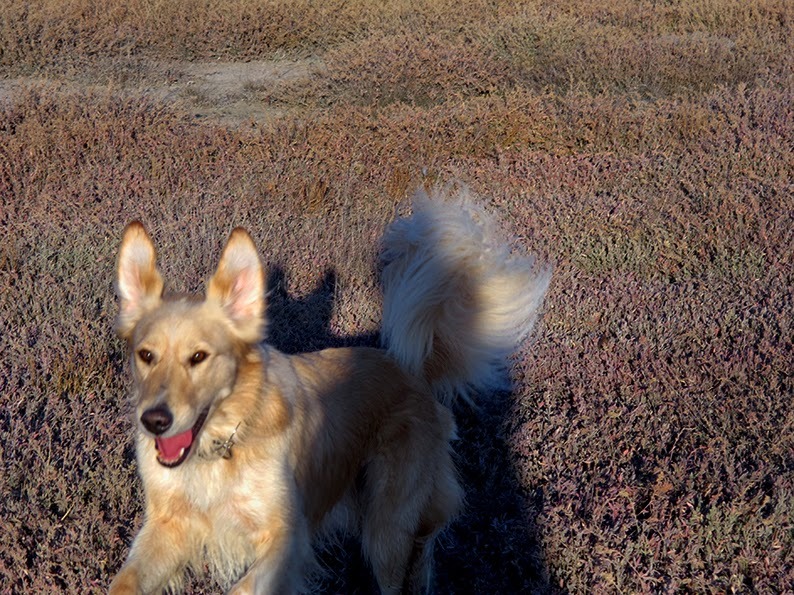 To read Kipling's story in my initial post, please click here. He was in pretty rough shape when he came to live with us. 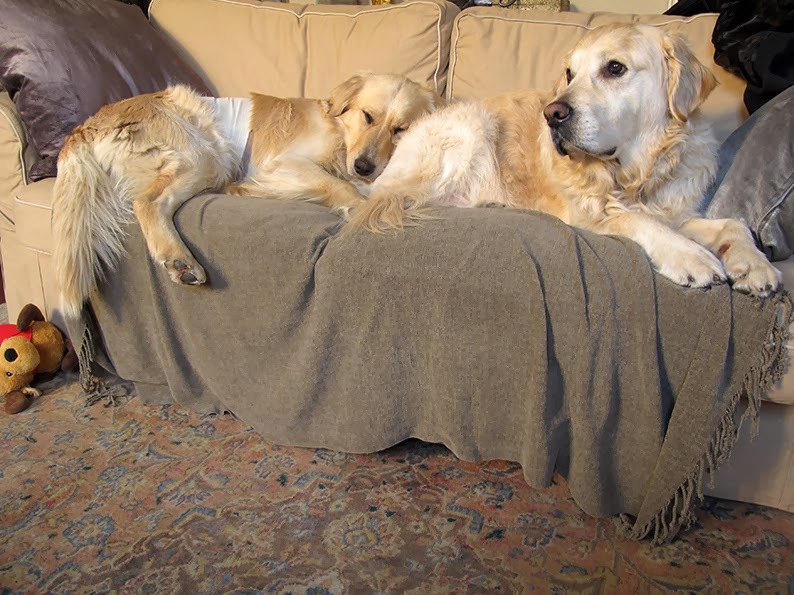 His recovery was long but he had Ben, ever the gentleman, to look out for him. Once he was healed, we started to understand who Kipling truly is. 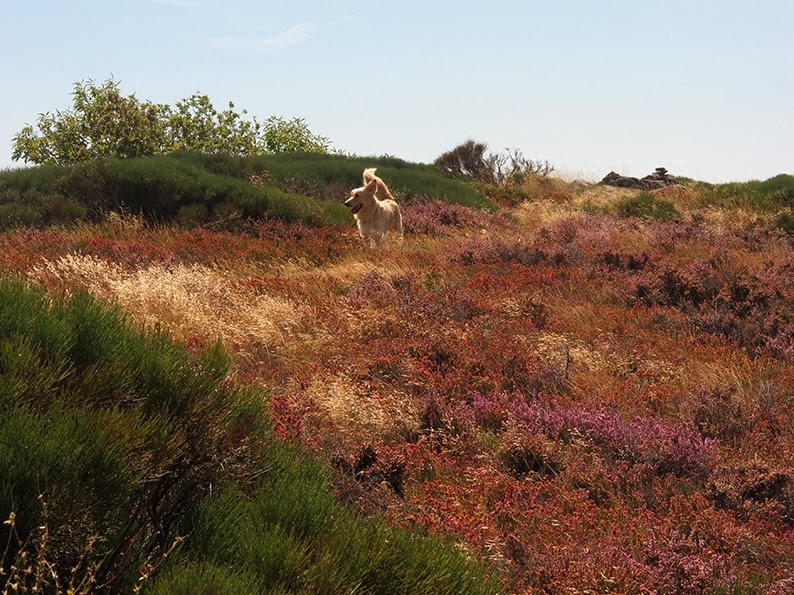 I remember taking the above photo so clearly, it was the first moment that we let him roam off leash in the Alpilles and how he transformed! 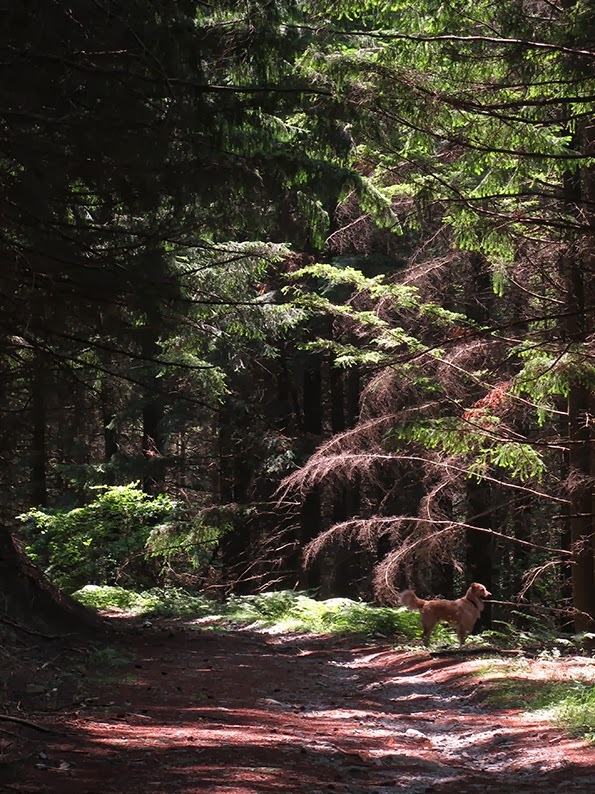 ...and always ready to explore (also at times too much - for while we have trained him to come when we call, he has still given us a few scares and we have to keep a strong eye on him). His speed and agility are truly amazing and beautiful to behold. Each characteristic is a clue as to what his life was before. We know that he was beaten but that he was allowed to sleep on the bed. That he rode shotgun in the car. That he isn't afraid of the hottest sun, that he loves the water but not the sea. Physically, he has changed as well. Although the fur that was shaved off his belly has not grown back, he is now at a proper weight. His eyes, which were closed slits when he arrived chez nous, are now open and bright. I believe that he is starting to really get it that we won't abandon him. While he is incredibly sweet with us at home, I have to admit that he is not always an easy dog in public. Since he has regained his strength, he has become more aggressive against cats, other dogs (of all shapes, sizes and ages) and even towards people if he thinks that I need protecting. That is a job that he takes very seriously and he does very well. Two weeks ago, while Remi was out of town, three men broke into the front hall of our building. Kipling heard them, started barking furiously and scared them away! Good boy, Kip. 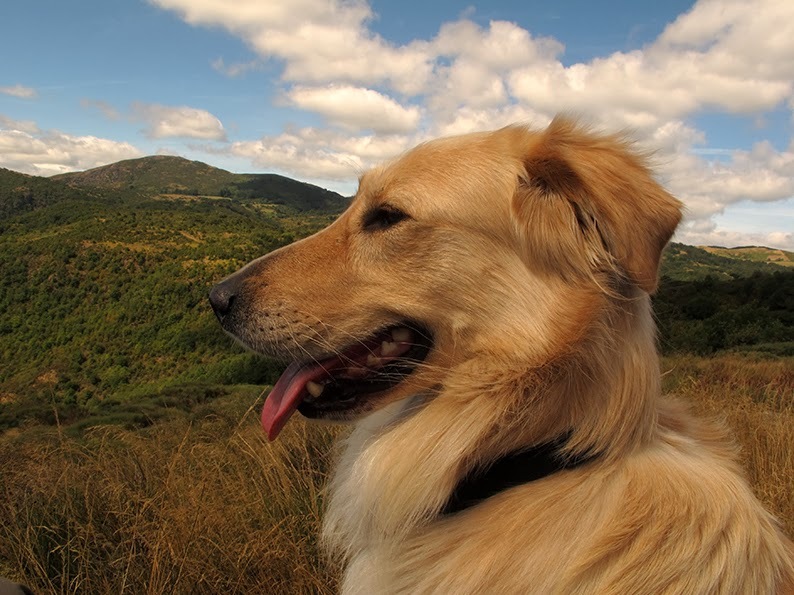 In the above photo, he is looking for son maitre who is far in the distance. He sat frozen like that until Remi returned. "That dog would follow you to the ends of the earth," I often say. And he would. 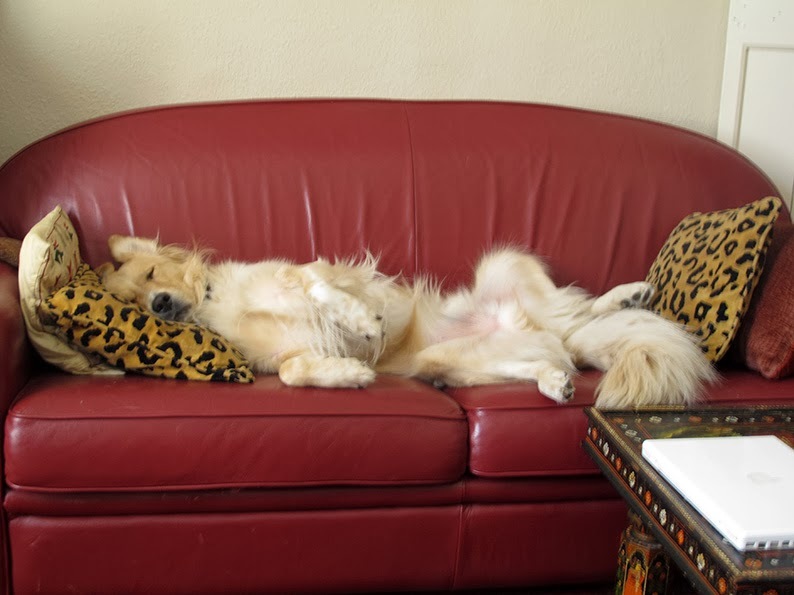 Just as Ben claimed the Napoleon III chaise-longue as a puppy, Kipling immediately decided that the red leather couch near my desk would be "his". Please excuse the inelegant pose but to see him so relaxed and undefended does my heart good. While he still has a tendency to follow me around from room to room, he has made progress with abandonment issues too. 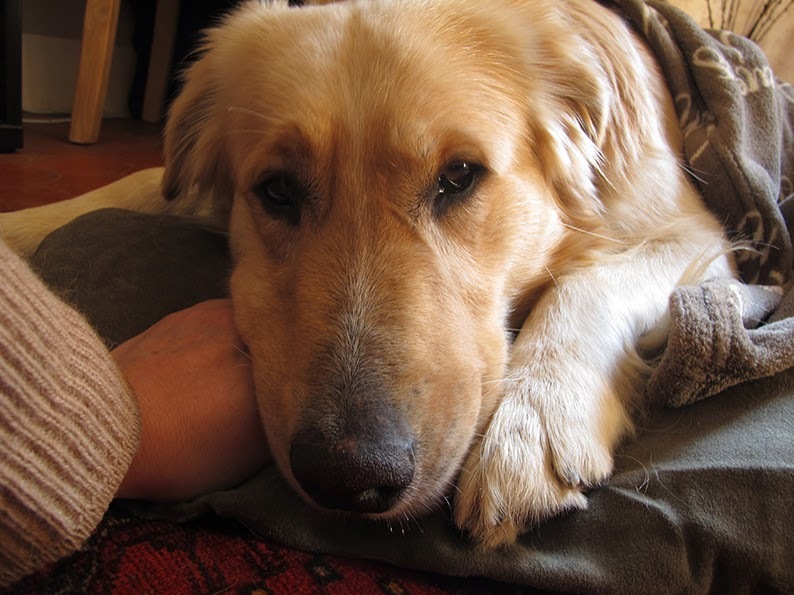 Now, when Remi and I leave the puppers behind when heading out the door, he no longer howls with worry but understands when we tell him, "We will come back." But what about Kipling and Ben together? That too is a work in progress. After a smooth beginning and even some cuddly moments, they have pulled apart. They get along fine but are not the best buddies that I would have hoped them to be. At least not yet. Kipling is only beginning to learn how to play. He doesn't have a clue what to do with toys and finally learned how to romp with another dog thanks to Ganache, the down-right goofy Rottweiler that lives at La Buissonade. Ben does try but Kipling hesitates. I think that if we are able to move to the country and each dog has more space, this will work itself out. They like each other, I know. For there are moments, as in this photo taken the other day, that suggest they might be getting closer. Kipling's arrival was also a challenge for Ben, who was very used to being the king of the roost. While we have continually assured him and showered him with love, he did pull away from Remi and I as well for some months. That too seems to finally be shifting back into a happier exchange as Ben understands that Kipling is here now and that we care for them both, enormously. Yes, there have been interesting negotiations of power between these two adult male dogs at times but they are subtle. And they have taught each other much as well. 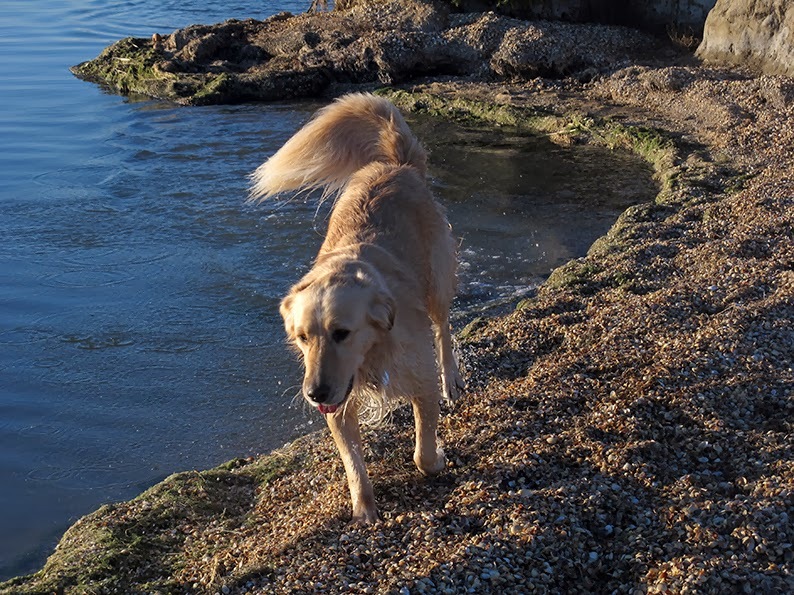 Kipling has shown Ben how to really explore the wild and Ben has shown Kipling, well, how to persuade me to give them their dinner (I also love that you can see his tail wagging "all the way around" in the video too)! Thank you for all that you have taught me too, Kipling. About patience and taking time to work through the challenges of trusting, some of which have taken longer than I could have ever imagined. As someone who grew up with dogs, it has been a humbling experience as well. You are your own dog, Kip. I see that you are trying and am moved by your efforts. It's just fine to be complex and not perfect as long as you are you. And those extra long walks that you need have done me a lot of good too! Happy First Anniversary in our Home, Kipling! We love you, little guy. For more adventures of Kipling and Ben, see here, here, here, here and here! Heather .. this is an absolutely necessary post for any dog lover to read. WELL DONE !!! BEAUTIFUL !! What a beautiful story and a story I can relate to so well. 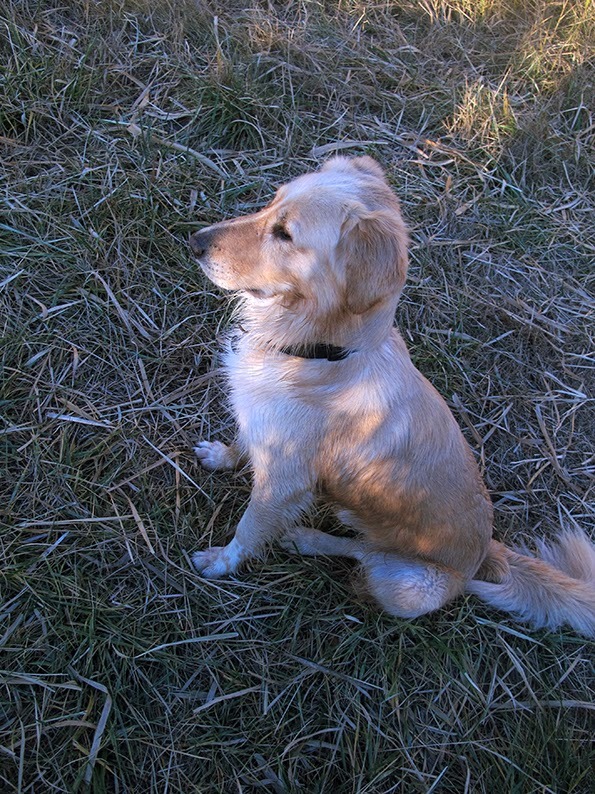 Our dog Charlie, who looks a little like Ben, is also a dog that was lost. We adopted him and I would give anything to know what his early life was like. I know certain things about him because of the way he responds to us and his surroundings. Thank you Gina. And how wonderful that you found Charlie, that he found you! 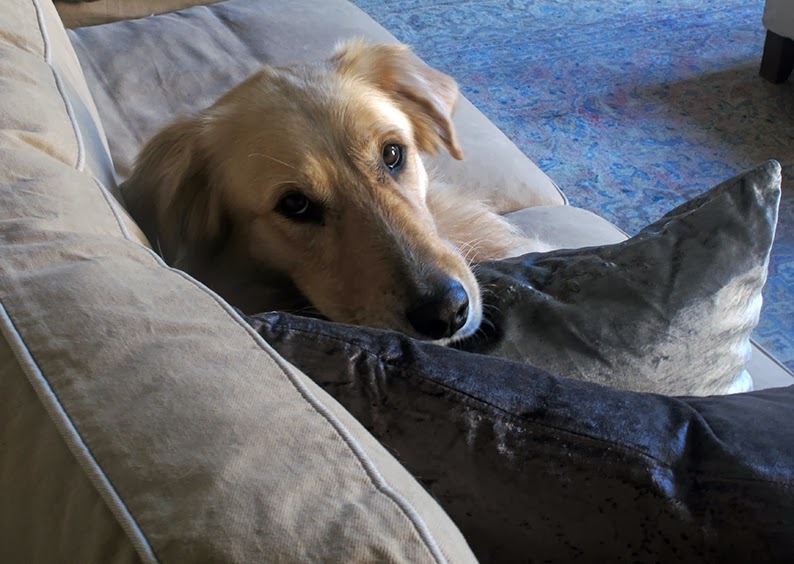 I am certain that he is in a loving home and that you spoil him just like we do Kipling--even if that can't make up for what they have been through already. And isn't it fascinating how much we can figure out just by the clues they give us? Hooray! :) At least his "parts" were covered. 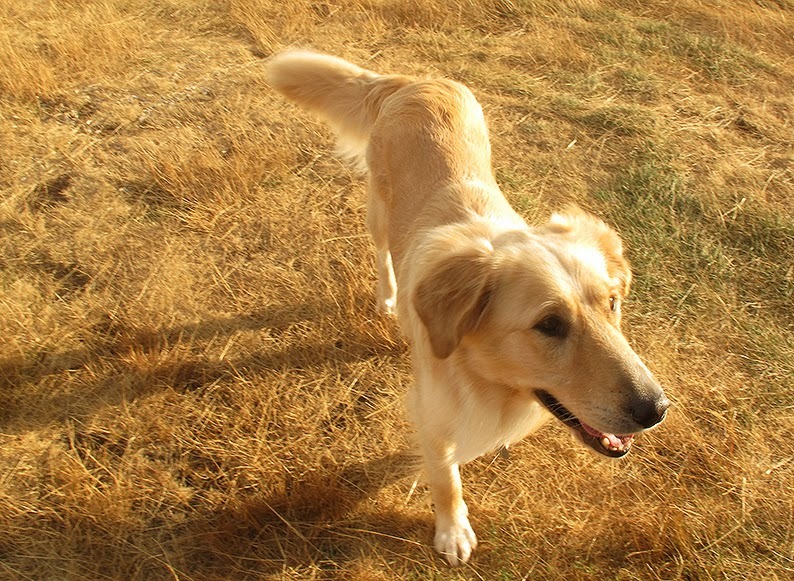 Kipling is to lucky to have found your family - he looks absolutely beautiful. Thank you for sharing his story with us! Congratulations on the one year anniversary! And for the honest account of what it means when you take an adult dog into your home. I often think that once Paul and I make our move and are there to stay, we will take in an adult rescue dog. It's not an easy decision, nor an easy task, but I can see from this post that it is incredibly rewarding for all involved. Sending extra pats and treats to Ben and Kipling. They are sleeping but they will be delivered when they wake up! And it really has been much more of a challenge than I would have thought. I think it depends on the dog and what their past was like. But oh, Judith, I would be the crazy old lady with a gazillion dogs if only I could afford it! Such a sweet story. We too took in an older rescue last year and we could not be happier with our little guy.Our very best to two good friends. Will send them your Best, Maryanne! And how amazing to take in an older rescue--that made me tear up just to think of it. Here in France, no one wants to adopt an older dog, just when they so need the comfort of a good home. Bravo to you and your family. Kipling sounds like a delightful family member. He keeps us on our toes! A complex character...I bet that you would like him. Ohh the lovely boy!!! And such lovely pictures! I am glad for him that you found him and I remember the post about it. As many other readers here, I too had tears in my eyes reading it back then. You all together look like a happy family though I belief it may not be easy in real life as Kipling has such different experiences that one does not even know for sure about. 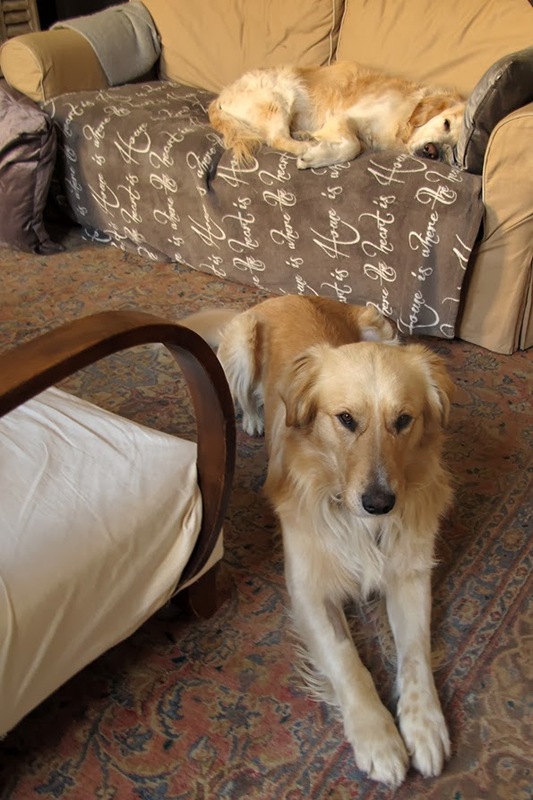 I am sure everything will workout well with Kipling and Ben and I hope you will find the right home for all of you! Thank you so very, very much for this lovely heart-felt response, Silke. I am so glad that you are here and are leaving comments! I took Kipling for an extra walk this afternoon since I had to pick up some things at the couturiere and he was so excited. And proud to have been asked so he was on his best behavior. I really think that if we can find a place in the country, things will change radically for the better. He is always on alert in town. I want him to be able to relax into a more familiar environment. 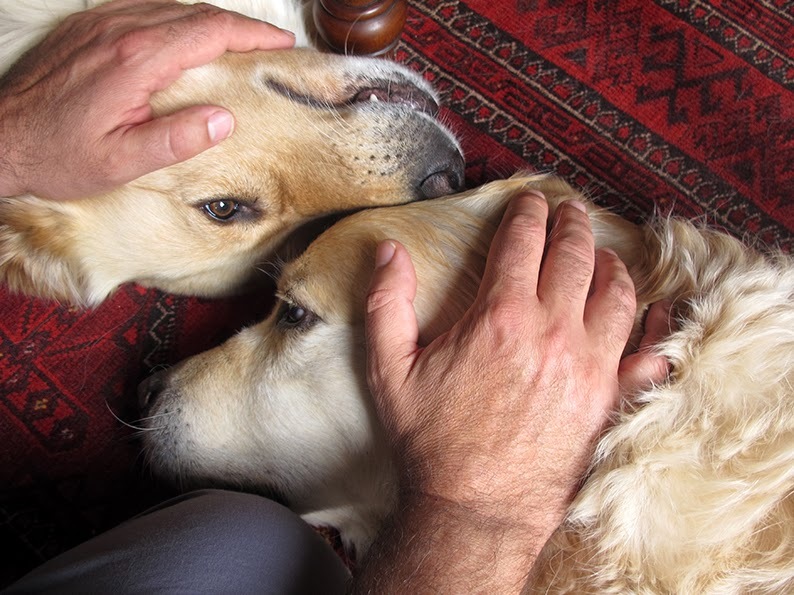 Kipling and Ben are such handsome and loving dogs, and so fortunate to have you both as parents! Thank you for sharing all of these wonderful photos and videos, Heather! Merci, Jeanne. Oh Ben would be over the moon for you, I know it! I can't believe it has been a year already! Just as your first story did, this one again has melted my heart. . .hugs to the two furry ones! What a wonderful post!!! Such great pictures and videos, and love the story of his first year with you, details of which I have been privy to! Isn't it funny how our puppies change and go through phases? Lucy and Tennyson have recently started playing again, after a mysterious break. And, of course, our pupper's personalities are SO evident! I love sweet, regal Ben and hope that I get to meet Kipling sooner than later! Ah, you would charm Kipling instantly and if anyone could coax him into playing, it would be you, wonderful Sister!! And that makes me really, really happy to hear that Lucy and Tennyson are playing again! Yay!!!! The look on Kipling's face at the SPA and how differently he looks now says it all, really. You were meant to find each other. Rémy is also a rescue, and also a challenging boy. Finney, our older guy, is almost 12 and Rem is two and so honestly, it's not the best fit. Poor Rem worships Finn but the feeling isn't mutual. I'm happy that Ben and Kipling are woking toward a true brotherhood. All of the pictures are just wonderful, and brought a tear to my eye. Oh I think that you had mentioned that Remy is a rescue too. So yes, you understand the challenges of working things through with a dog who has had a troubled past. It all depends of course - my Mom saved her Sweetie (if only you could see him, he is one HUGE dog) on the day he was supposed to be put down and he moved into her life without a hitch! It is amazing. Poor Finn probably just wants to be left a bit in peace and Rem just wants to be near his big Brother...they are so amazing, aren't they? Now you are going to make me teary! What a sweet, sweet dog. We are so lucky with our cats - we got them from a Siamese rescue organization, but I don't think they have ever been mistreated. They were loving and trusting from day one - the one follows me around like a puppy and the other is a little more aloof, but they both will flop back so we can rub their bellies and purr and purr. What kind of person is mean to animals? But thank you as always Leslie for your wonderfulness and enjoy the snow! 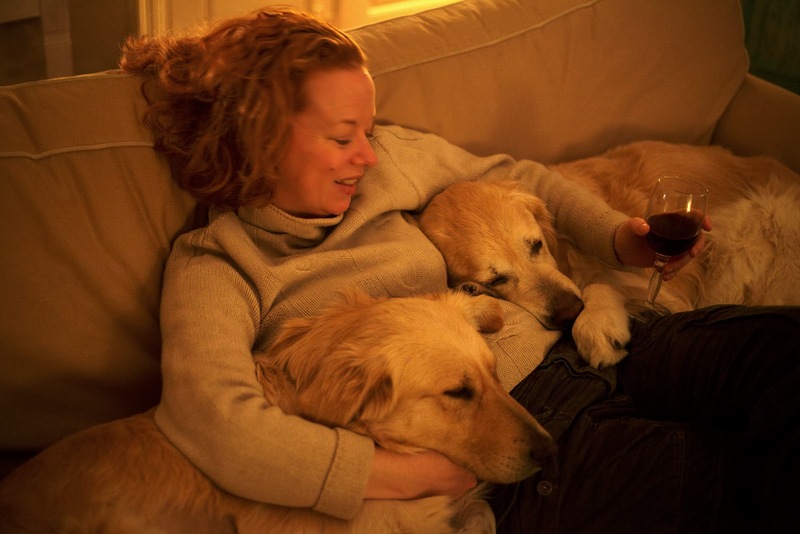 The photos say EVERYTHING!He is HAPPY and YOU are too with your glass of red vino!We seldom get a photo of YOU and I love it when we do!Beautiful dogs……..to land in a beautiful home with you two.The country is calling………you will find the perfect place! Then I come teach YOU to drive! Gros Bisous to you Lovely Lady. I can't believe that it's a year already since Kipling arrived in your family! This is a really warm post. I loved the video of the two of them demanding that it is NOW dinner time and just hurry up! May he long add something to your home and to Ben's entertainment as well! When I was playing the video of the two of them barking, I have my Labrador, Piper sitting beside me while I'm at the computer. I thought he might look up and wonder where the barking was coming from, but no, he's contentedly having a day dream... Snooze on! And it is the weekend now so...snooze on it is! Aw - happy anniversary Kipling - you are one lucky guy :) Thank you for writing this post and for loving Kipling as much as you all do. Truly warmed my heart! How appropriate that I read your lovely post today. We adopted a girl from the pound 15 years ago. She was one year old at the time but had been abused by men and it took her a while to trust my husband. Today we sadly had to take her to the vet, well you can guess the rest. I feel comfort in the fact that she had a fantastic life with us. You, too, are doing an amazing thing for Kipling. Oh Sharon, I am so very, very sorry for your loss. I wish that I was there to give you a long hug. They are our family. That she went to the Rainbow Bridge at 16 says so much about the wonderful life that she had with you. 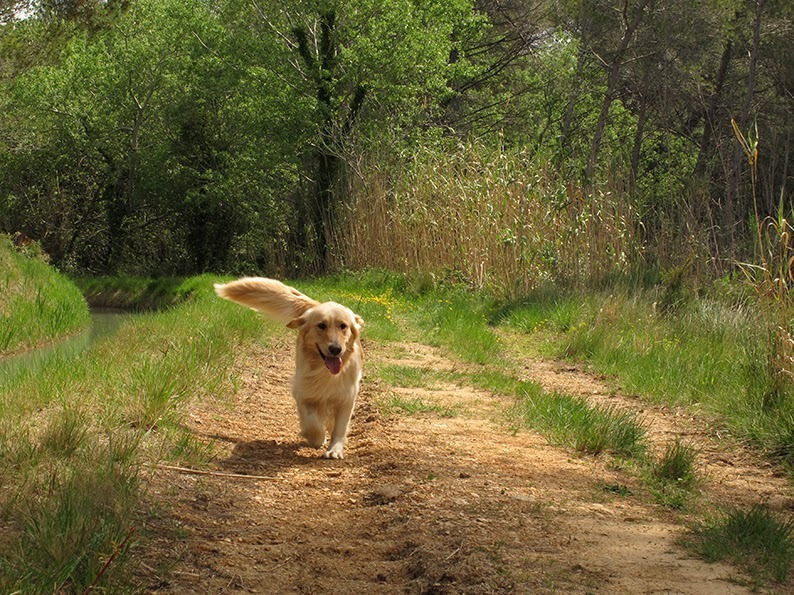 It is part of how our dogs can bring out the very Best in us, isn't it? I have a friend who parted with her 15 year old dog yesterday too. It was time and it was the right thing to do. 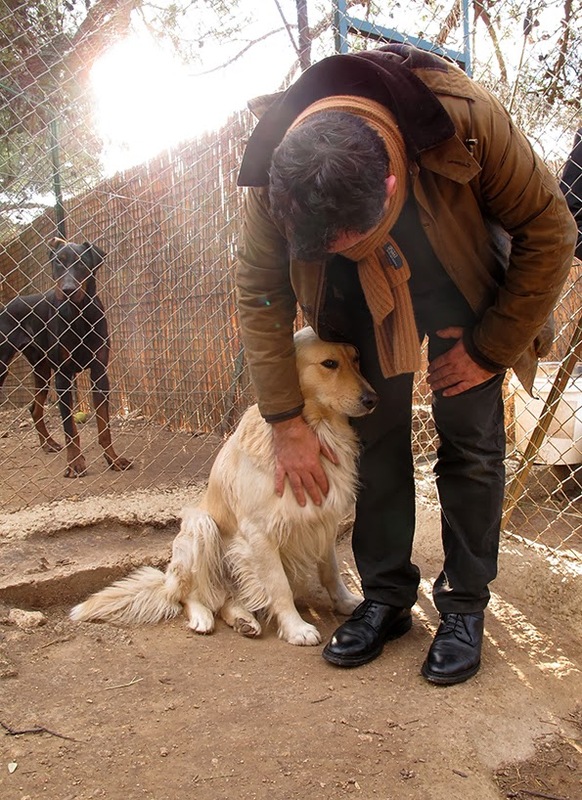 While she is grieving, she is also celebrating the dogs exceptional spirit and I find that so admirable. What a beautiful tribute to your dear Kipling! I remember when you found each other. It is truly heartwarming to hear and see how you all have grown and adjusted. I love the posts with Ben and Kipling and the important role they play in your journey...unconditional love and all! A love story, perfect for this coming week and St Valentine's. Happy 1st Birthday (like a rebirth) Kipling. Abandonment traumatizes even dogs. Kipling was not abused physically and the feeling of being unloved or abandoned didn’t seem to leave a deep scar. Kipling looks like a happy contented dog with your and Remi’s love and care. Actually, we do know that he was abused physically as his front teeth were broken and from his reactions to any overhead gesture from us (such as swatting at a fly). And his scars from abandonement are very deep, I think, so does Remi. It gives credit to Kipling that he has made as much effort towards us and Ben as he has. I know that he wants to get back to that happy place that he must have known at some point in his life. There is actually even a very specific physical type of man that he distrusts, so we even have an idea of what his abuser looks/ed like. Awww, glad he is progressing. Two males in the same house is never easy! Dogs are the best though! Great story, my first visit, the dogs are just beautiful and really fill your life. I miss my Dalmation so much. Fourteen years is such a true gift, Yvonne. And the bond that we can have with our furry companions...well, that good feeling can spread out into the rest of our lives too. Have a lovely weekend and Welcome! Happy Anniversary to you all! It use to be easy to tell them apart. Ben's not being cool with Kipling in the beginning was a good sign that's Ben. Today, less so as Kipling looks more like Ben in many photos, poses, attitudes. Now I think they can both do the look of "When is he leaving?" Nah, they just both guys and so don't want to show how much they care for each other. But trust me, they do. And they DEFINITELY have picked up physical traits from each other. Ben does this goofy thing where he shakes his head when he is happy--and now Kip does it too! Well, J.D. Ackerley (otherwise an irretrievable curmudgeon) once wrote "A dog has but one aim in life: to bestow his heart". Obviously (to me, at least) the same applies to you and Remi. (I'm supposed to heed the pleas of my gallery owners and update the damned thing today.....a grim and dreary business, as far as I'm concerned. I'm not the sort who wants to spend time looking at what I did three or more months ago). I can't even remember what I did three weeks ago, let ago three months! This is why the whole book idea is slow-going. I haven't forgotten, friend it is just still brewing. Heather?.....each of the 2 dogs has four feet (that equals eight).....both you and Remi still have ( I'm assuming) two feet. Eight plus four= 12, which is to say that (between you, Remi, and the two dogs, there are twelve feet in the "family"). Like all attempts at witticisms, this is not going to become any funnier by being "explained". Oh dear. It is official. After a week of not sleeping, this is...drumroll...the wierdest of all of my...miscalcualtions in terms of math or time. Because, Uncle David? I promise in my pre-tea state, I was sincere in my calculations. My bumblings this week have been hors pair. So this, while it should be the most embarrassing, is not actually. What does that tell you. No question mark needed. Oh, its fine, Heather......I recall that, after typing that, I MADE A POINT OF GOING OVER THE MATH (about six times) in order to make sure (as near as is possible) that this English major had gotten his math (actually, just his counting) right. It still makes me groan with embarrassment every time that I think of it! A beautiful story, lovely dogs and they have a wonderful home. It's very hard to believe how animals can be mistreated by humans. Never have got my head around that one. Glad to hear that eleni, thank you! And I feel the same. It makes me too sad to even think about! OMG, can it be a year already?! I am so proud of you and Remi that you stuck it out with them, nurtured them, loved them, took them out and about, and have been great parents and leaders. Kip is lovely, isn't he? I love his nose. And, Ben has always had this amazing soulful look in his eyes which I love. Bravo to both of you for rescuing this lovely creature and turning him into a happy dog with a really really good home. I love you both !! My neighbor Christine has always been a bit scared of Kip--understandably as he likes to have a good "Here I am!" bark when he comes out of our building. The other day, out of nowhere, he finally softened up to her and put on his sweet face instead of his tough one. She looked at him and said, "He is really beautiful!" That made me happy. What a sweet post Heather. It is plain to see that your puppies have captured your heart. 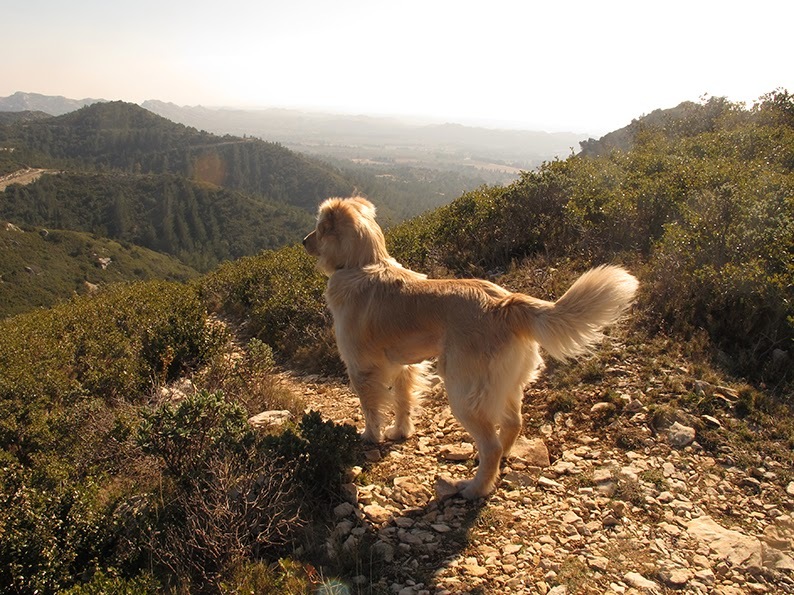 I love the picture of Kipling staring out over the paysage. I hope you are having a great Sunday. We went to Uzes for lunch with friends and then kept exploring the villages there, so we had a great Sunday! Provence is calling you!!! If I were to be reincarnated, I'd like to return as one of your dogs. That would be the life! Wow! A year already? Bet you can hardly imagine your lives without him now.